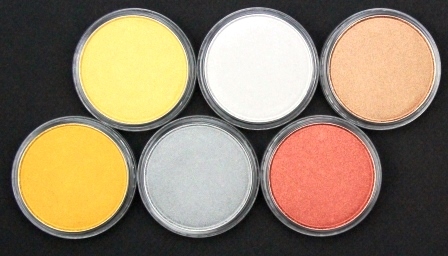 • Super–Blendable so you can mix them with the other 80 colours for an infinite palette of metallic effect colours. • Versatile – can be used on almost any surface. • Value – PanPastels last 4-5 times longer than the average pastel stick. Whether you are an artist or a crafter they will add a whole new dimension to your work. A range of 3 rich, lustrous metallic colours which have all the same great properties as the original 80 colours. Includes Bronze, Light Gold and Rich Gold. A range of rich, lustrous metallic colours which have all the same great properties as the original 80 colours. Includes Silver, Pewter, Copper.